Summer time is here which means the grill has been working over time as we spend the warm weather enjoying backyard BBQs. Well, here are my tips to grilling great pork chops that will be sure to please even the pickiest eaters. I know this because they are approved by my mom who could easily be considered the world’s pickiest eater. 1. Pick the best pork chops at the grocery store. Pick chops that are a darker pink color and have good marbling throughout, avoid chops that are lighter pink or lack marbling. No, they won’t be, and shouldn’t be, as red as a steak but opt for pork chops that are darker pink. 1a. If your local grocery store has a meat counter, see if they will cut a whole pork loin and have them place however many chops equates to one meal for your family in a package. Have your chops cut somewhere between one and two inches. A thicker pork chop won’t dry out as quickly when cooked. Note: You also can cut a whole pork loin yourself. Make sure you have a sharp knife and freezer paper or bags to keep the pork chops if you aren’t preparing them right away. 2. Completely thaw frozen pork chops. If you have previously frozen the pork chops, place them in the fridge two to three days prior to when you want to eat them so they are completely thawed. Fresh pork chops are ideal, but freezing chops will not degrade the quality if they are packaged correctly and used within three to six months. If the pork chops are completely thawed it will ensure that they cook evenly. I think they tend to be more tender and flavorful compared with cooking partially frozen chops. 3. Select a good pork seasoning. This can be easier said than done. Growing up in a pig farming family and we always had access to great pork seasoning from our county pork association. Even through college, I had friends who brought pork seasoning from home. I never had the challenge of finding pork seasoning in a grocery store. A few months ago, I wanted to make some pork chops but forgot to bring pork seasoning from home. I went to the local grocery store and was baffled by the lack of options that would taste good with pork. I opted for a rib rub that ended up being average, at best. Martin County Magic is sold by the Martin County Pork Producers in Minnesota. It is MSG and gluten-free and costs $9 for a 13-ounce bottle. Steak & Chop is sold by Lynch BBQ in Waucoma, Iowa, and is another great option for pork chops. This seasoning comes in three different sizes, so you don’t have to worry about over committing. They have a full line of seasoning and sauces that cater to a wide variety of taste buds. *Disclaimer: These are two of my favorites. There are many delicious options out there to try! You can check with a local pork producers association or meat processor to see if they carry pork seasoning for purchase. 4. Grill those pork chops. Throw those pork chops on a preheated grill and sprinkle them with seasoning. Cook approximately six to seven minutes for chops thicker than ¾ inch and then flip. After flipping the pork chops, add more seasoning. 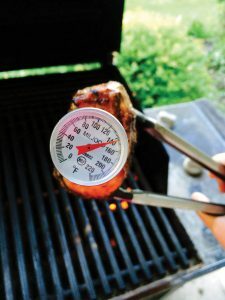 Cook this side an additional six to seven minutes or until a meat thermometer inserted through the side of the chop toward the middle reads 145 degrees Fahrenheit. Remove the pork chops from the grill and cover with tin foil or rest in a microwave for three to four minutes to allow the chops to continue cooking without losing those delicious juices! Here’s a fun fact: Did you know pork is a red meat? So it is ok to have some pink in your pork chops. If you prefer no pink, cook your pork chops at 150 to 155 degrees Fahrenheit. Just promise me you won’t exceed an internal temperature of 160 degrees Fahrenheit. That will dry them out. The summer weather is gorgeous and begging you to get outside and fire up the grill. So what are you waiting for? Grab some pork chops and get grilling. If you want more pork recipes, visit www.porkbeinspired.com. The best part of this website is that you can sort the recipes based on cooking method and cut of pork. You are sure to find some crowd pleasers! 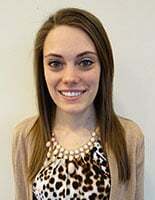 Sarah Marketon serves as the Director of Communication for Wisconsin Farm Bureau. She is a Minnesota native and an active member of the swine industry, which sparked her interest in helping farmers share their story. She is passionate about answering consumers’ questions about how food is raised and encouraging farmers to engage in those conversations.